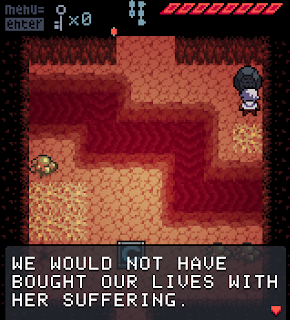 I have very mixed feelings about Anodyne. It's been quite fun to play, but it's been equally frustrating in many parts. It plays a little like the original Legend of Zelda, from back in the days of the NES. Most of the gameplay is fun, but it's also littered with annoying segments, particularly in the form of jumping puzzles. The environments are quite pretty, and diverse as well. I didn't think to take more screenshots while playing, unfortunately. Anyways, each area has a very nice and distinct feeling to it, and it often felt to me like they each had a story of their own to tell. The music adds well to the feel of the game. It tends to be fairly mellow, and never really takes over anything in particular. One big thing that I have to mention is that the game has a mostly-open world. Having played up to the final boss, I can definitely say that for most of the game you can choose the order in which you complete things. The game also has quite a bit of exploration, and there are plenty of screens that exist solely to show you something pretty. Oh boy, where to begin... Starting off, it's one of the buggier indie games I've played. I've run into a number of little oddities. Once, I got teleported through a wall into a boss room(which saved me some time, but still...). Another time, my body appeared to be perpetually stuck in the air while my hitbox(and weapon) remained firmly planted on the ground. These bugs, and a number of other things make me wonder if perhaps the programmer was a bit inexperienced when they made this. For instance, the final upgrade that you receive allows you to swap tiles, but only seems to work in one screen in the entire game to swap a few blocks around. This, coupled with a few areas blocked off by pushable-looking objects makes me wonder if perhaps there was a pushing mechanic that was scrapped, either because of time constraints or programming issues. Another letdown was the jumping. When you get the ability to jump, it feels like many possibilities have opened. However, you can only jump over things, not on top of them. All of the tiny little ledges in the game are still completely insurmountable. You also can't attack while jumping(another missed opportunity), but you stop in place like you did! The hit detection when it comes to jumping feels pretty terrible. Oftentimes I'd fall into a pit when it felt like I'd made the jump. The eventual addition if speed boosting tiles just makes this problem worse, especially once they expect you to hit them at weird angles. When you get hit, instead of being knocked away from the source you seem to be knocked in the opposite direction that you're facing. This can make even simple obstacles a huge pain to deal with. Finally, most bosses can be defeated rather easily by just sticking to them and mashing the attack button. It feels like such a cheap tactic should've been noticed and removed, because it completely takes the skill out of the fight. It's not a big deal, but it's still a bit sad to see all of those interesting attack patterns go to waste thanks to a simple cheese tactic. The game's not really as bad as I might've made it out to be. It was a big pain in the rear at times, but it also gave me hours of fun. I didn't quite manage to beat the final boss in time, but the fact that I played almost all the way through while making this certainly stands in its' favor. Lastly I feel like I should point out that the game is pretty much a giant fetch quest. To be fair, so were Ultima 1 and Bastion to some extent, and it's also a part of the general genre. Still, collection does end up being the main focus of the game, so just be aware of that. If you really enjoy these sorts of old-school, top-down, hack-and.....beat with a broom games, then you should probably check this out. Otherwise, you may want to wait for a sale or bundle to grab it.